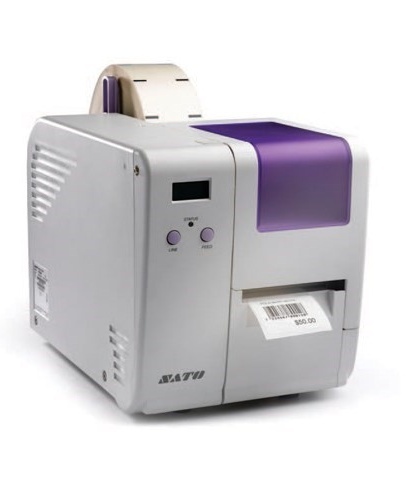 The new SATO DR308e printer caters to the retailers' increasing need for more visible price marking and in-store merchandise promotion and can accommodate thicker tags; up to 0.28 mm. The DR3 printing applications include: garment tags, luggage tags, price labels, shelf-edge labels, food safety labels, patron admission tickets, patient wristbands and more. Primary opportunities are expected to be in the retail, logistics, and hospitality and entertainment sectors. The new printer offers improved standalone printing capabilities, using a new keypad tool, removing the need to connect to a PC or host system, thus saving on IT investments. The operator inputs variable data using the keypad and the sends data for print when required. The entire printer is designed for easy configuration without having to rely on a host PC system. The printer can be operated as well in online mode while connected to a host system to enable monitoring and remote printer management of even multiple printers. Its unique plug-in interface card design offers flexible connectivity options for users depending on their application requirements. The DR3 has been designed with flexible media pitch sensors to achieve the best start-of and end-of-print capabilities. This allows detection of label and tag holes or gaps wherever they might be, and by extension help avoid the need for unsightly marks that guide correct printed data positioning. The printer comes with options such as cutter, stacker, label rewinder, and dispenser to facilitate on-demand printing. The SATO DR308e is ideal for high-quality In-Store price ticketing while also being suitable for luggage tags, price labelling, shelf-edge, admission tickets, wristbands etc. Label format are easily designed on PC using the supplied software and transferred to the keypad via the SD memory card.